Elliot, the man supposedly resurrected from the dead. 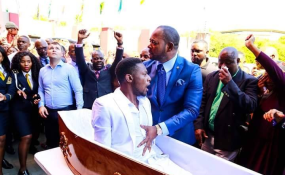 Alleluia Ministries church pastor Alph Lukau, who is said to have resurrected a man who was in a coffin at the weekend, has said the man was already alive when he arrived at the church. Speaking to Gauteng broadcaster PowerFM's Power Drive host Thabiso Tema on Wednesday evening, Lukau said he was busy with a sermon on Sunday when he was interrupted and told that a person in a coffin had been brought to the church. When asked by the host why the man had been brought to the church in the first place, Lukau said: "I am not sure if I can make a statement that he was brought to me. We are the house of God and I'm just a pastor serving in the house of the Lord." He added that further questions about why the man was brought to the church would be better answered by the man's family. "I think that they brought the person to church because they believed that God had the ability to resurrect the person," Lukau said. The pastor seemed to dodge Tema's questions on whether he had the ability and powers to bring a dead person back to life. After repeated attempts by Tema, Lukau eventually said he had no ability, "except if God used me as an instrument". "I can safely say and clarify that I did not pray to resurrect the person, I don't want to take that credit. Should God ask me to resurrect somebody and give me grace and the power, by faith I will try that," said Lukau. He added it was the first time there had been such a case at the church. Earlier, the Commission for the Promotion and Protection of the Rights of Cultural, Religious and Linguistic Communities (CRL Commission) said it would summon the church to explain Sunday's incident. However, Lukau says there is nothing for the church to explain. In a statement released on Wednesday evening, shortly before Lukau's interview, Alleluia Ministries vehemently denied that its lead pastor had resurrected the man. It claimed that the mortuary vehicle, which was from Kings and Queens Funeral services, was brought to the church by the family. It echoed Lukau, saying that by the time the vehicle entered its premises, there was already movement inside the coffin. "Prior to even praying over Elliot (the man who was in the coffin), pastor Alph states that Elliot was in fact breathing," the church said in a statement. The church further said it had no interactions with Elliot or his supposed family prior to their arrival at the church. "In addition, and in order to dispose of the incorrect reports that a cameraman depicted in certain photos with pastor Alph on social media is, in fact, Elliot, this is not the case and the cameraman is still employed by the church," it said. The church also said it had no engagements with any funeral parlours, as has been widely reported. This is despite the parlours saying that they had been approached to transport the body to the church. In a video doing the rounds on social media, a Kings and Queens Real Funeral Services hearse can be seen transporting the coffin into the church where Lukau and congregants prayed for the man who rose out of the coffin.